Whether it’s a power outage, a bad storm or a flat tire, life’s little emergencies don’t make reservations. All you can do is be prepared. 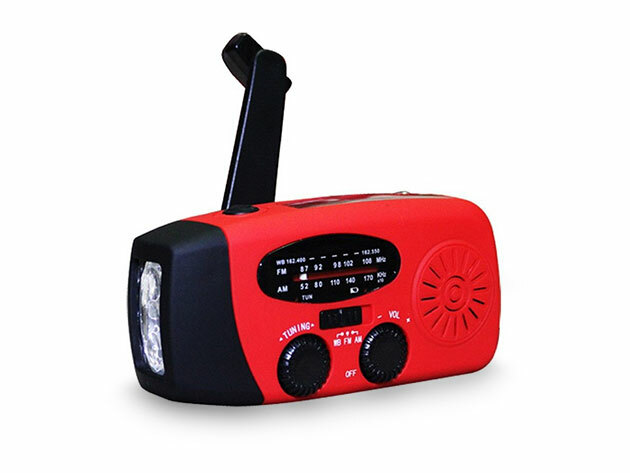 If you’re not sure where to start, the Emergency Multi-Function Radio & Flashlight is loaded up with the must-haves you’ll need in a hectic situation. This slick radio and flashlight combo charges up with solar power or a hand crank, so you won’t need to worry about replacing batteries or running out of power when you need it the most. It catches the NOAA weather broadcast 24 hours a day, seven days a week, so you can stay up-to-date during nasty storms. It also has a multi-band tuner for AM and FM radio, and a telescopic antenna to keep you connected. This radio’s features don’t stop there: the LED flashlight has a lifespan of 100,000 hours, and it shines at an impressive 5,000 lux. There’s also a USB cable and adapter — the onboard battery allows you to charge your phone, so you can make calls or send texts if you’re dealing with a power outage. The Emergency Multi-Function Radio & Flashlight usually costs $89.95, but right now it’s on sale for $28 (68% off). That’s affordable enough to buy multiple units for your home, car, or wherever else you might face an emergency.